At the crisp, early dawn of 5:30 am today we dropped off our darling 14-year-old in a church parking lot. Outfitted in a purple calico print, her waist to ankle skirt shifted awkwardly around her middle and her matching bonnet extended as if to accommodate a command to “walk the plank”. From there she would board a bus to transport her and hundreds of other youth to the middle of Wyoming where they planned to set up camp and kick it old school. It is her very first Pioneer Trek. For those unfamiliar, it is rather common among us Latter-Day Saints to pay homage to those who have gone before us by retracing some of the steps of our pioneer ancestors. Some say it is a life changing experience, others say it is hot. To be fair, I cannot weigh in with authority as it has never been my lot privilege to participate. Nevertheless, I think we all know where I would come down. (Hey, don’t judge. I’m VERY sensitive to the heat.) One thing is for sure, it is not enough to don a pair of jeans and some sunglasses for this journey. No, in order to create an authentic experience it is believed that one must also wear authentic clothing. Seems noble, doesn’t it? I don’t know, let’s ask these ladies. First of all, I think the most awesome thing that could occur right now is if you happen to be the woman in this picture and you are reading this blog. So help me, if you are that woman, please please PLEASE send me an email and I will promptly mail you half a pound of some legit horehound candy. (Let’s be real: I think we’re all relieved there’s no ‘w’ in ‘horehound’, are we not?) (Ideally I would have posted a picture of my daughter in her outfit, but I’m in the business of trying to gain her trust and seeing as I JUST got her to divulge the name of her current crush, I’m not about to blow it by plastering close ups of her “What Not To Wear” before photo.) Second of all, I’m pretty sure that lady is NOT reading this so with fingers crossed I’d like to share what I think about this picture. The way I see it, this woman ended up modeling pioneer clothing in one of three ways. Either she is, a) a struggling model still searching for her big break, b) a friend or family member of the person who runs this website or, c) someone with a sordid past who is being blackmailed. 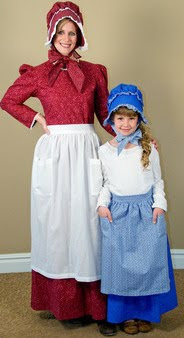 (Either you pose in this bonnet or I’ll send THESE pictures to The “Enquirer”! [she yells through her tears] Fine! I’ll do it! But this is the LAST! TIME!) If the answer is “a”, I’d like to say…good luck with that. If the answer is “b”, well then good for you because now somebody is eternally in your debt. As for “c”, don’t be naïve. You had to know those pictures would come back to haunt you. Oh well, one thing is for sure; I don’t care how fast that chick can churn butter she’s not getting a date in the 21st century. I'm getting the idea that pioneer retro is not going to be your style any time soon? My daughter killed a chicken bare handed on her pioneer trek. UGH!! I don't think any pioneers sang as much as they say unless it was "We Gotta Get Out of This Place." Oh that is fuuuunnnnny, lol! I hope your daughter has fun on the trek! Are you in the Arapahoe stake? My brother Aaron and his wife Niki were so lucky to go on that trip as Ma and Pa!!! :) I hope she has fun, the Wyoming trip really is worth it! CO Oldroyds: I think you're doing quite enough shlepping along for Girl's Camp! I don't know how they got so many volunteers either, but hallelujah for that because thanks to them I slept in this morning GUILT FREE. Never done a trek. Not sure I would survive the heat and my air conditioner would miss me. When I was in primary we used to change the lyrics to "pioneer children sang as they walked, and tripped, and fell, and died..."
Oh man, I know the model in that picture! Without divulging too much (because I really like her), she is a model, not exactly "struggling," and would probably find this post really funny! Oh I love it! I usually go to the thrift store to get all the pioneer clothes for the kids when they go on their trek. They would have thought I was way to awesome if I would have actually bought them new clothes to ruin. Thank goodness, when they were done, they just had a clothes burning party and were eternally grateful not to have to use them again! Love the post. So funny! Jodi: SERIOUSLY?! If you get that woman to make a comment or email me I will totally send her a prize. The title of this post is the BEST! Seriously? This idea of happily singing, never complaining, smiling none stop in dire circumstances has always WAY bugged me. That said, the historian in me would love to do a trek someday - assuming the trek had easy access to a hotel that is. I like Marianne. And this post is HILARIOUS! I've done a minor trek, and although it was a great experience, the sun poisoning an subsequent peeling for the following three months led to no singing on my part! 2) Hot rollers, too? Really?